She came out, her head down, face averted. 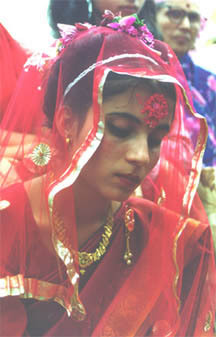 She was dressed in a brilliant red sari with a matching gilded veil. In her hair, she wore white flowers. 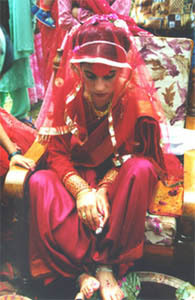 Her hands were covered in intricate patterns of henna and from her wrists dangled red and gold bangles. 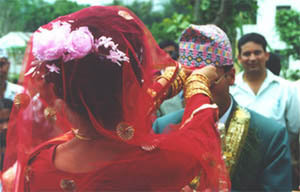 Hanging from her ears and around her neck, was the traditional Nepali gold jewelry, a gift from her future husband. As Tika waits in front of the chairs, she approaches from behind with a bronze carafe filled with water and circles him three times, pouring the water slowly, creating a trail around him. Then she reaches up to give him a tikka with both her hands. There was a Brahmin in the simple white clothing of priesthood, continually chanting and while symbolic gestures of offerings were made. At one point, a tray was brought out and blessed. A white sheet was taken and draped in front of Tika, only his cupped hands peeking out from underneath. 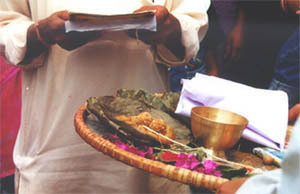 Into those waiting hands, various puja offerings were blessed and placed, til overflowing. If any should fall, it would be inauspicious. Over him, red rice was thrown. There were rotis, bananas, rice, coconut, prasad, sweets, flowers and money. Around Tika's neck was placed a garland of grass festooned with shiny foil baubles. 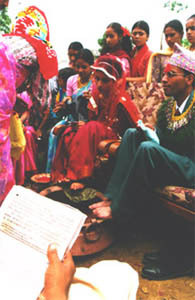 It is a very traditonal garland worn by the bridegroom and made by the bride. They exchanged rings and more blessings. The next ritual consisted of him holding an opened umbrella. The priest and other male friends showered him with the red rice yet again. Finally it was time to chow down. Friends and family of the bride are served earlier in the day before the groom's entourage arrives. Now it was our turn to eat. The bride and groom do not eat together. We headed over to the main tent and friends of her family served an excellent meal buffet style. There was pulao (rice fried in ghee with fruit and nuts) mutton curry, two kinds of vegetable curry and delicious chutneys and ochars (pickled vegetables.) For dessert, sweet curd (yoghurt) and fruit. After the meal, they take a seat at the two chairs and a large copper vessel is placed before them. The priests continues a steady litany of chants off to one side. Throughout all this, she appears miserable. I ask if this is normal, and they all agree. Brides are supposed to be sad, upset and scared. Many are so shy, they bury their heads in their laps throughout the entire ceremony. They are leaving the only family they have ever known and becoming a part of a new family. Severing all ties to her family. she must now work for the welfare of her new family. Who knows what awaits them. 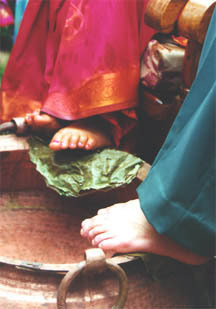 Their feet are placed on the rim of the copper vessel, over ritual leaf mats. The person giving a blessing pours water over both of their feet, their right hand ready to catch the water as it flows over their feet. The well-wisher sips the water and then throws it over his own head. This symbolized humbleness and a very important sign of respect for the new couple. In Hindu and Buddhist culture, the head is the most ritually pure part of the body, and the feet the least. A well-wisher is showing that the droppings from their feet are more pure than the person's own head on this most important day. Then, a small envelope filled with rupees is given to each of them. Depending on the size of the crowd, this can last for hours. 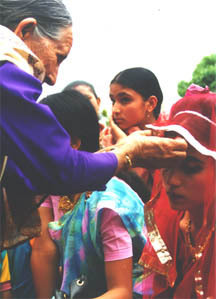 After the blessings are given, her parents gather close. Her mother holds the bronze vessel filled with water. They place their hands into the center. First her father, then her, and then her husband. 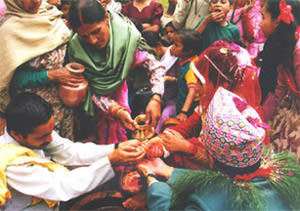 Slowly, her mother pours the water over her father's hands which dribbles into her own and then finally into Tika's hands before falling to the copper vessel below. This is the symbolic moment when she, from her mother's womb and her father's home is given to her new husband. 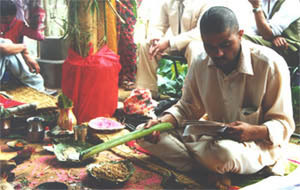 As the rituals wore on, people grew bored and milled about. Men gathered under canopies and played cards, especially the highly popular game called marriage but entirely unrelated to the festivities and placed enthusiasically anywhere, at any given time. There were the musicians who played off to one side, in the shed reserved for cattle. People milled about and some, enboldened by the local raksi, broke out into dance. But nothing seems to lift her melancholy. Her face is resigned to her fate, her karma, her bhagye...she now belongs to him. She disappears inside her home to change from the sari given to her by her parents into a new sari from her husband, further driving home the point. Meanwhile, the priest seats himself at the sacred fire and continues his Sanskitic chanting.